One of the benefits of having a couple of mates who don’t drive, is that they have an encyclopedic knowledge of the rail network, and how to take advantage of it. I was taught a trick a couple of years ago about ticket splitting, and how it can save you a fortune. I’ve basically now found a way of getting to London on a Saturday for around twenty quid, by simply buying advance singles between Derby and Birmingham, and then from Birmingham to Euston. Of course, it does mean early starts and late returns, which doesn’t bother me in the slightest, and it always means that the journey can take quite a bit longer than if you took the more traditional and indeed more expensive routes, but it’s a small price to pay for a cheap day out. When I booked the tickets in December I was looking at doing a Football League game, the two clubs I need in London, Charlton and Fulham, were at home, it was just a case of picking the one I preferred. 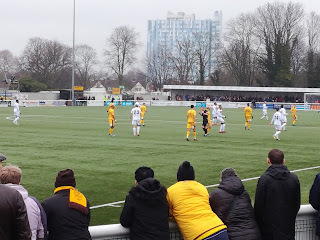 But then I spotted that Sutton United were kicking off at 12.30 as the game with Dagenham & Redbridge was being shown on BT Sport, and that put my brain into overdrive. If that game finished around 2.20pm, where could I get in forty minutes by public transport? 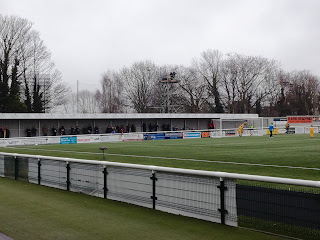 The answer was simple, two train stops and a five minute walk would get me to the Colston Avenue home of Carshalton Athletic by around a quarter to three. 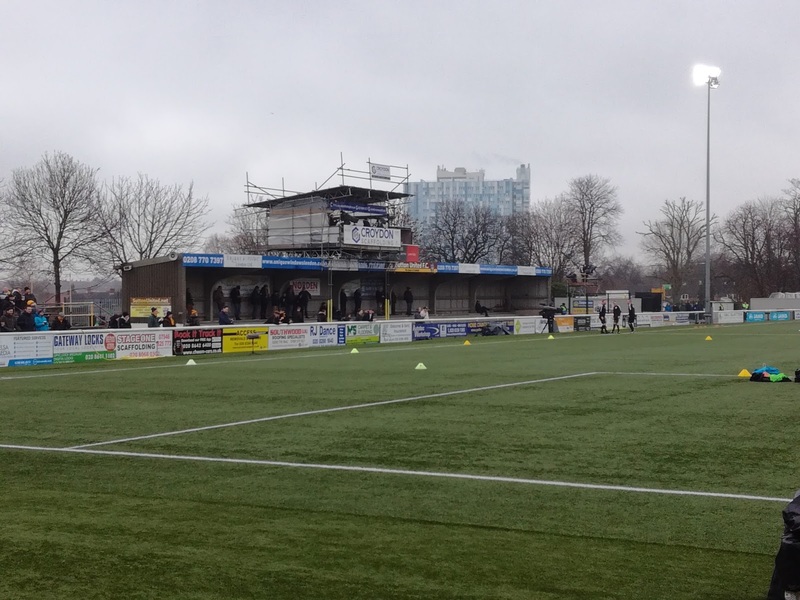 Both Sutton and Carshalton play on artificial pitches so bingo, it was tickety split-tastic, a plan was hatched, Fulham and Charlton will have to wait for another day. It was a cold morning as I walked down to Belper station for the 6.43am to Derby. It was on time and sparsely populated, but the Birmingham bound train was pretty empty, and a snooze could be afforded before disembarking at New Street. New Street is very smart these days, compared to the dump it once was, but at 8am on a Saturday not much is happening, the shops are shut and the eateries yet to fire up. The Euston bound Virgin Train was packed, confused travelers on the way to Birmingham Airport sat in the wrong seats and bashed legs as they humped suitcases down the aisles. Normality resumed as the bewildered departed for their flights, and then as the remainder of the student population finally did one at Coventry, the train was spacious and peaceful, the carefully prepared packed lunch courtesy of Mrs H could be unwrapped in more tranquil surroundings. That's What You Call A Gantry! With a Travel Card already in place, it was straight through a crowded Euston to the Victoria Line, and then a mere three stops later it was onto an equally busy Victoria station to wait for the Horsham bound train that would take me to Sutton. A crawl to Clapham Junction with Battersea Power Station looming large just over the Chelsea Bridge slowed us up slightly but soon the train arrived in Sutton and a quick change to West Sutton saw me walking up to the ground at 11.15, well in time for the kick off, and certainly in time for some of God’s finest in the clubhouse. A large Met presence was waiting outside the nearby pub, clearly the travelling Daggers had to be watched over carefully, but as the pub was not yet open, I chose to head straight to the clubhouse, where BT Sport expert summariser Dean Saunders was holding court. Deano is a Rams legend, and was the scorer of one of the finest goals my old mate Matt never saw at Villa Park. Matt had already been ejected by the West Midlands Police when Saunders put his head on a Paul Goddard cross and scored from twenty yards! Great days, you couldn’t beat a good ejection from a football ground as a teenager to increase your credibility. The same Police force did it to me a couple of years later at Molineux, a proud day I have to say! 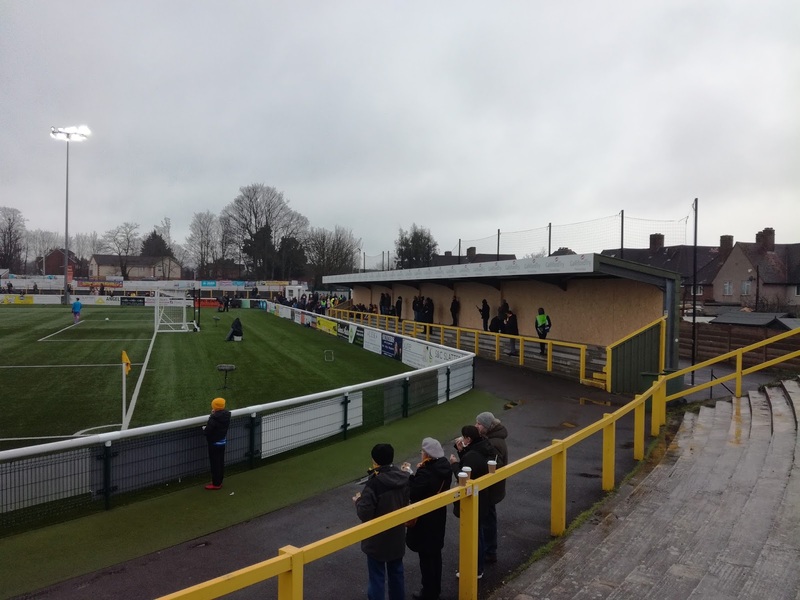 Gander Green Lane is a mixture of the old and the new. The clubhouse was a large building, with various rooms used for serving food and drinks to the visiting officials, sponsors et al. 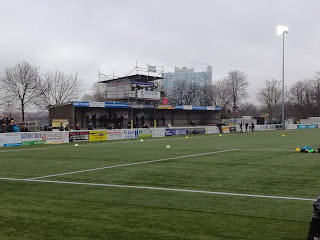 Next to the clubhouse was the two story block which served as the main entrance and the club offices, while in front of this was the old main stand that is synonymous with Sutton United. The ground is effectively a huge bowl, with curved terracing in the corners behind the West goal exemplifying it, but the covered areas behind both goals have been moved forward so they are nearer the pitch, however it’s still possible to see the outline of what went before. 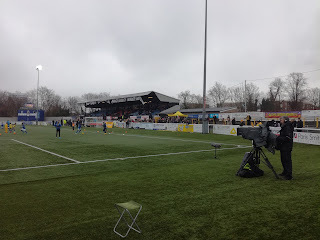 Another covered terrace sits opposite the main stand, but both stands on either sides are quite a distance from the pitch, again, testimony to the fact the ground was once elliptical in shape. 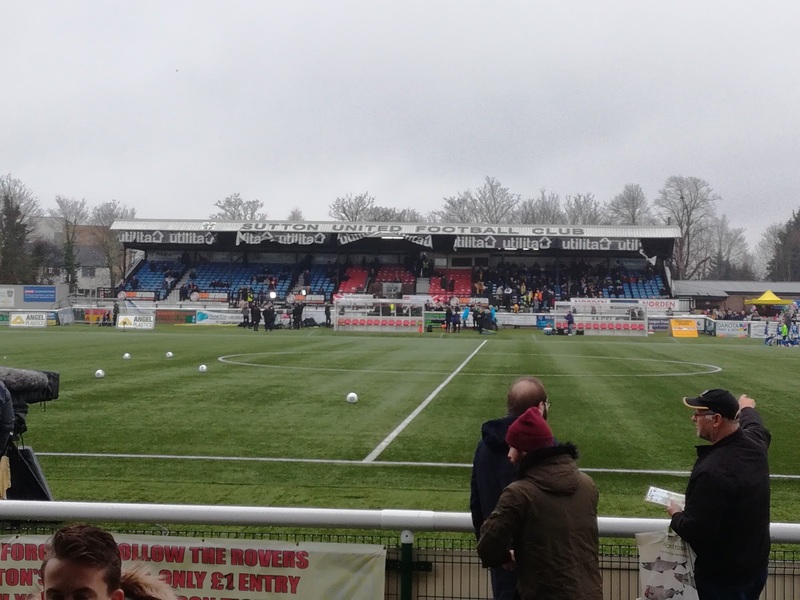 The new artificial surface is clearly doing wonders for the club in terms of community use and driving revenue, but, with them sat in a Play Off place, will they be allowed to compete as the Football League will not accept synthetic surfaces? Just over 2000 turned up, along with around 150 from the East end who were segregated behind the East goal. 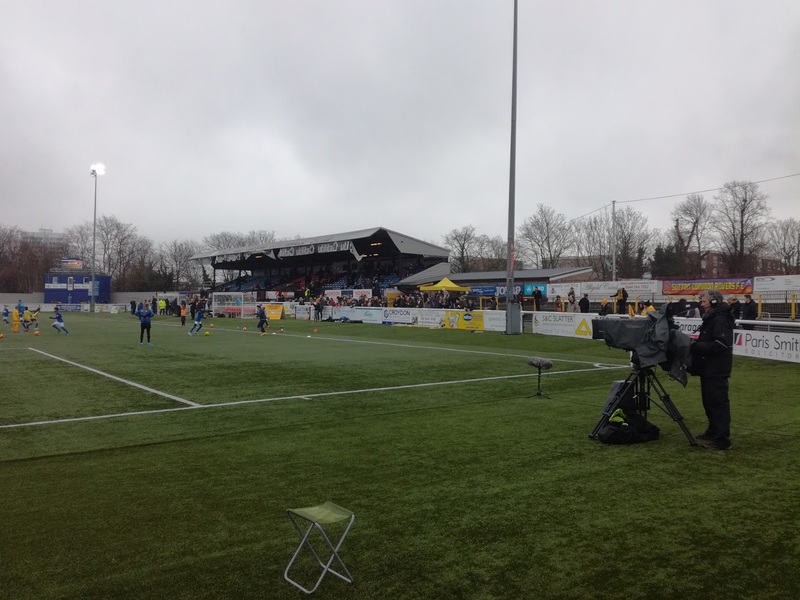 It was a damp and drizzly afternoon, but after a goalless first half, Sutton really turned on the style in the second period. Tommy Wright capitalised on a mistake and rounded Daggers goalkeeper Mark Cousins to give the hosts a 58th minute lead, only for Tom Bolarinwa to powerfully head home the second goal just three minutes later. 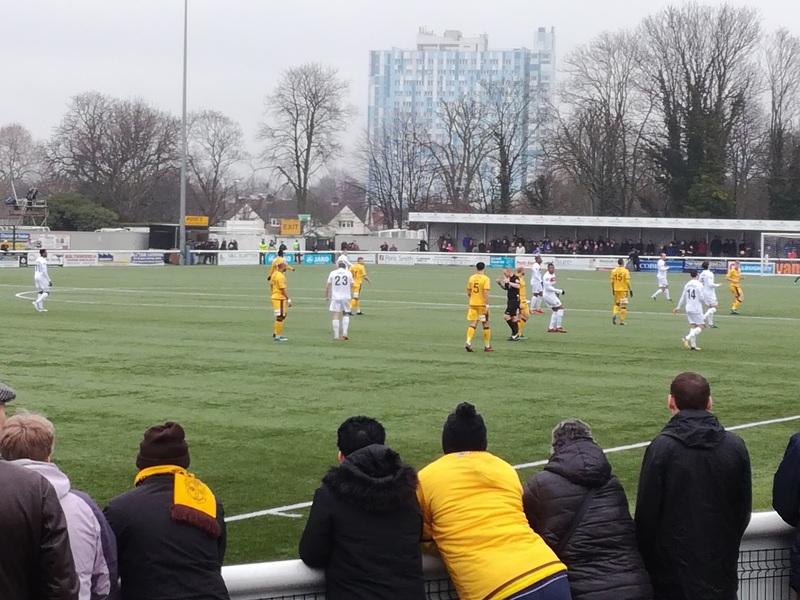 It was the least Sutton deserved after a controlled and powerful display. Fejiri Okenabirhie pulled a goal back for the visitors in the 85th minute, but it was the hosts who finished the stronger with Craig Dundas almost spectacularly heading past Cousins but the keeper scrambled back to clear the ball off the line. 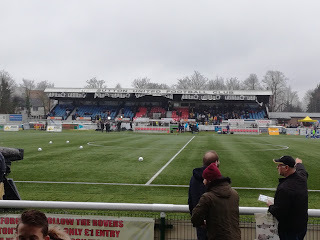 So, Sutton move up to second in the table, and the club probably more famed for their FA Cup exploits over the years (no mention of any pies) with victories over Leeds United, AFC Wimbledon and Coventry City hitting the headlines along with THAT defeat to Arsenal, are very well placed to be in the mix for promotion to the Football League. Sadly though, it may not be their playing efforts that dictate whether that happens or not. 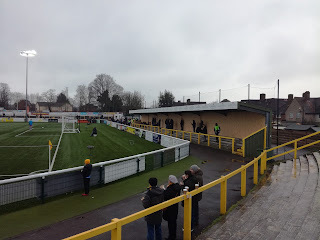 With the rain pouring, there was no time to reflect, it was the short two minute walk to West Sutton station, I was on a tight timescale, but as the train rolled out in the direction of Sutton and then Carshalton, I did think to myself that Sutton United really do have the potential to be a League club. 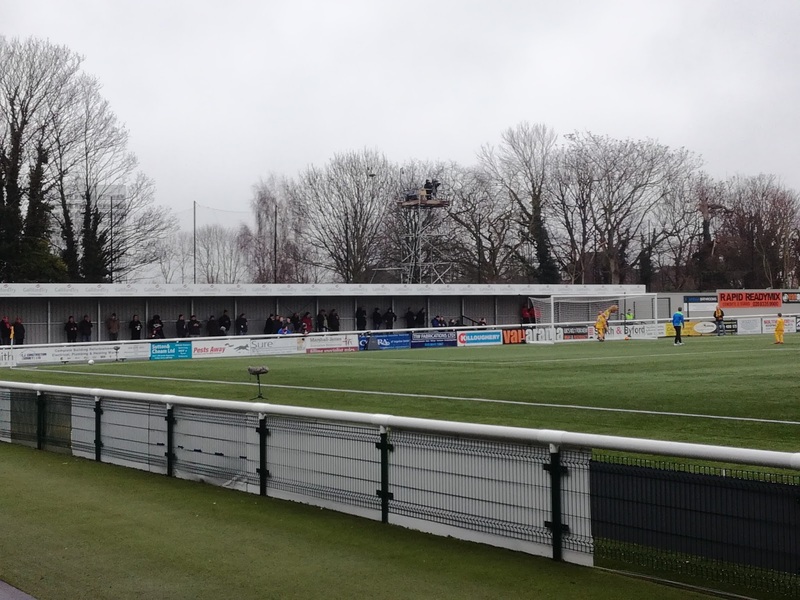 In a tightly compacted part of the Country when it comes to football, averaging over 2000 spectators is no mean feat, but Sutton, and indeed high flying Bromley have got hurdles to overcome first if they want the rewards their excellent football teams warrant. This is a story that is going to rumble on……..